Since getting back from our trip west to our daughter's wedding, my mother has been placed permanently in a nursing home. I've been going back and forth a bit to help out and trying to live life 3 1/2 hours away. A few doctors appointments along with my siblings and I packing up her things from her apartment. That was bittersweet, pleasant and painful both. What wasn't packed in boxes to be stored or taken by family, was donated. I also received from Nancy a jar of honey and a cute Longaberger basket. Thank you Nancy. I wound up this yarn and I couldn't believe how big the cakes ended up being. I love this yarn and I can't wait to get started on knitting it up in the Bozeman Vest. The mornings now are so beautifully cool, but we're still having nice weather in the 70's and low 80's, which I am enjoying, the snow will be here before you know it and I'm enjoying each day till it gets here. I call this next photo the morning after The Blood Moon Lunar Eclipse. Did you all see it last night? Wasn't it awesome! Vee over at A Haven for Vee had a link on her blog about a tea cup and mug exchange, so I had to go over and see what it was about. Stephanie at The Enchanting Rose was hosting the swap and I just had to join up. This is what I received in the mail from Patricia. A beautiful tea cup and delicious smelling teas. I can't wait to have a cup of tea. My "new" tea cup joins the others in my corner curio cabinet. I hope my lady likes the tea cup I picked out for her. I chose one from my collection. I did not take a photo of the one I sent :( I'm sorry I didn't. Thank You Patricia I love it all!! Head on over to see the pretty tea cups and mugs everyone received. It's been raining lately and foggy up on the ridge here, and we came home and the light was on. Mr put windows in the cupola with a light, and it looks really, really, cool. The barn is almost 100% done, except for the roof and hopefully that will be done soon. Mr is not doing that himself and I'm glad he's not as I'd worry the whole time it was going on, we are leaving that to the professionals. I joined a Fall Kitchen Towel Swap and I received my package, look how pretty the towel is. We got a few apples from the apple orchard last week, and dried them in the dehydrator. I have to give credit where credit is due, Mr did it all, I'm just eating them like they are candy. I'm trying to catch up on blog reading, in between helping to hang quilts for the Quilt Guild's quilt show this weekend, make two fall kitchen towels and send them out, and anything else I've put on my plate, plus trying to take care of things around here, life just never slows down. For our anniversary (BTW...Thanks for all the anniversary wishes! They were very much appreciated) we went to the river and had lunch at Pete's Hamburgers, but first we had to stop at Cabela's. Check out the link to see what Pete's Hamburgers are all about. Life continues to be good here, and I hope Y'all are doing good too. I can't believe I forgot to post about the swaps I was in. The first one here is the Christmas Apron swap. My partner was Renee over at Sew With Grace. In the package was the apron, a Christmas towel and spoon ornament. I love them all. I was also in a Pillow swap over at Dutch Sisters. My partner was Deb from New Zealand. Look at the beautiful pillow cover she made. I enjoy doing swaps, you meet such wonderful people. It's time for the Soup Swap over at Turkey Cookies. I didn't get a picture of this one...Sorry! Combine all ingredients except coleslaw mix, simmer for 30 minutes. Add coleslaw mix and simmer 30 more minutes. The consistency is more like chili than stew. Note: For those of you who do Weight Watchers this is 2 pt's per cup. This has some zing to it and it's wonderful. We had some left over and put it over a bed of rice...YUMMY! To see more soups head on over to Jessica's blog Turkey Cookies. Randi is hosting The Recipe Box Swap again, and this month's theme is "Fun Foods" or anything that is sugary, salty, sticky or fattening. I went to the "Fun Food" expert in our house, my son Dan. I had him tell me what he thought a fun food was, and he said "Scotcharoos...so, Scotcharoos it is. In a large saucepan, over medium heat, combine corn syrup and sugar. Bring to a boil, stirring constantly. Remove from heat, stir in peanut butter; mix well. Add cereal; mix well. Press into a greased 9x13 pan. Set aside. In a small saucepan, melt chips together. Spread over bars, chill about 15 minutes before cutting. I couldn't stop at just one recipe. My DIL makes these and I can't claim the recipe. Put sugar, corn syrup and peanut butter in a sauce pan and bring to a boil. Add corn flakes and mix well. Spread into a 9x13 greased pan. Cut when cool. eta: My DIL says to add the peanut butter after the sugar and corn syrup boil. Or is it too early yet? You are not going to believe this. I have just added another thing to do on my project list of things to make. I have been really thinking about learning how to Quilt. Seeing my DIL's work and blogging friends who Quilt I have been thinking about it, but that is as far as I've gotten...just the thinking process. I did start one when my sons were in the Army. I found fabric in many different states as we traveled to see them. This is as far as I have gotten with it. I want to finish and put it in the guest room. This is one of my projects to get done this year. I did make a baby quilt about 10 years ago for someone. The numbers on the picture are not accurate, the date on our camera was not set right and I didn't know how to fix it. Bet your wondering what I'm doing eh? Well I have joined this swap and I've made one block already. I can't wait to make more. I know, I know you think I'm nuts...and your probably right, like I don't have enough on my plate already. But, this year I plan to keep busy and hope to really get back into sewing and continue to knit and I have some memory books to make. I'm thinking there's nothing wrong with keeping your days busy. So what's with the Spring cleaning? I have gone full tilt in cleaning my messy, unorganized sewing room and if I want to do all that I plan to do I need to get my mess cleaned up and sorted out. It's back to work on my mess after a short break. You all have a super day on this -3° day. 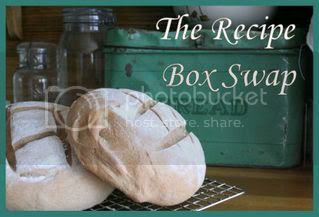 Randi over at I have to say is hosting a Recipe Box Swap. The theme is Holiday Favorites. Our holiday favorite is the Christmas Butter Cookies that I make every year. For those of you who have been reading my blog for a while may have seen this posted on Kelli's Show and Tell. But, I just had to share this again because this is a holiday favorite in our house. Cream Butter, add Sugar gradually, cream until fluffy. Add beaten Egg & Vanilla, beat well. Sift together the dry ingredients. Blend into creamed mixture. Roll onto floured board about 1/8 inch thick. Cut out with cookie cutters. Place on unbuttered cookie sheet. Note: If cookies are rolled too thin they may burn. Also when rolling the dough, if it is too sticky, don't be afraid to use flour as you roll. By adding more flour to help with the rolling you won't hurt the dough. It seems like the more you add the better it rolls and the better the cookie. Use your scraps too, I use every bit of my dough scraps, I hardly throw any dough away. When they are all cooled you can either frost them or just leave them plain. Either way they are delicious.